The world's cutting-edge particle accelerators are pushing the extremes in high-brightness beams and ultrashort pulses to explore matter in new ways. To optimize their performance—and to prepare for next-generation facilities that will push these extremes further—scientists have devised a new tool that can measure how bright these beams are, even for pulses that last only femtoseconds (quadrillionths of a second) or attoseconds (quintillionths of a second). Comparing 1 attosecond to 1 second is like comparing 1 second to 31.7 billion years. This tool can also measure beam sizes to within a few tens of nanometers (billionths of a meter) - without disrupting experiments that rely on these beams. The new tool, dubbed a "charge density monitor," could also provide more precise measures of fundamental physics in high-energy and high-field beam experiments, and help guide R&D efforts that seek to shrink the size and cost of particle collider and accelerator facilities while ramping up their capabilities. The research using this proposed diagnostic could also impact disciplines ranging from plasma science to atomic physics, and could lead to new applications and reveal new physics. At the U.S. Department of Energy's Berkeley Lab Laser Accelerator (BELLA) Center, researchers hope to test this tool by measuring particle properties in the aftermath of an intense laser beam drilling through a jet of gas. In doing so, they hope to learn about the electron beam pulse emerging from this interaction. "BELLA provides an ideal test bed for evaluating the potential of the beam-measuring method at a state-of-the-art advanced accelerator, since we aim at producing the brightest possible ultrashort bursts of electrons with our compact accelerator technology," said Wim Leemans, director of the BELLA Center and the Accelerator Technology & Applied Physics Division at Lawrence Berkeley National Laboratory (Berkeley Lab). "It would provide a powerful tool for measuring and improving BELLA's beams." Leemans led the Berkeley Lab team of contributors as part of an international team in a technical study detailing the new method, published in the May 10 issue of the journal Physical Review X.
Roxana Tarkeshian, a researcher at the University of Bern and previously at the Paul Scherrer Institute, served as the lead author of the study and has pursued the new diagnostic method since 2015, with support from Thomas Feurer, a professor at the University of Bern and an expert in laser-based technology and space physics. "Its ultrasensitive measurements at high resolution, and its low cost and compactness are among its assets," Tarkeshian said. 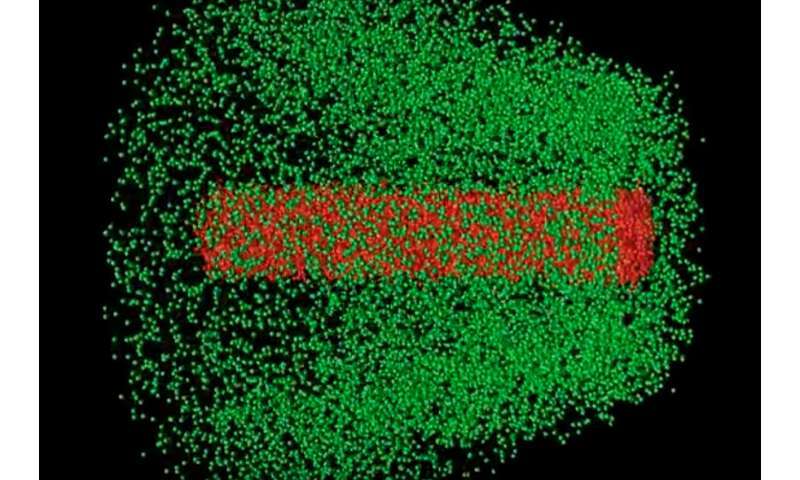 The study details how intense particle beams can barrel through a low-density neutral gas, stripping away electrons from gas atoms through the strong electric fields associated with intense particle beams. An ionized (charged) cloud of matter known as a plasma—containing ions and electrons—forms in the process. The technique's "unprecedented" resolution for the duration and size of individual pulses for both electron beams and positron beams relates to an effect in which small changes in beam brightness of just a few percent to tens of percent can result in tens to hundreds of times more ions generated in the presence of an electric field, Tarkeshian noted. The process is similar to what happens when a very intense, focused laser beam or X-ray pulse interacts with a gas and ionizes the atoms. But there are important differences in the physics of this ionization process for beams of light (photons) vs. other types of particle beams. With beams of light, electrons and ions (charged particles) are produced throughout the beam's footprint, and the plasma-associated electrons have a relatively low velocity and tend to hang around the column of ions until they are pulled away by an external electric field. Ions with positive charges then drift in the opposite direction and can be measured. For electron (negatively charged) or positron (positively charged) particle beams, the shape of the electric field resembles a doughnut and produces a ring-shaped plasma column, with no ions initially left in the beam path—the hole of the doughnut. These particle beams can supply a powerful kick to electrons, which can leave a ring-shaped column of ions behind. And those ions can be guided away by an electric field to a detector that measures the number of ions, their speed, and their charged state. The latest study shows that the new measurement tool can also glean more information about the beam itself from this "ion doughnut" under the right operating conditions—with the right density and mix of gases, for example. The team carried out sophisticated simulations using a Berkeley Lab-refined computer code known as WARP and another code known as VSim. Researchers modeled the interaction of particle and photon beams with gases and the ensuing plasma-related dynamics. 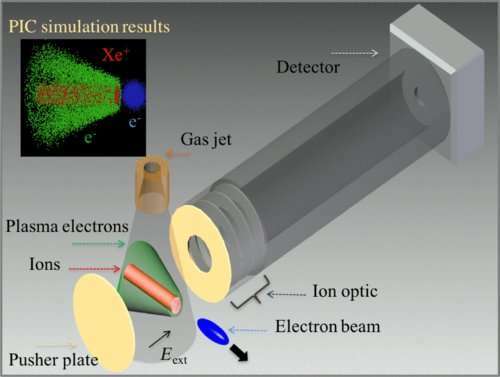 "The simulations allowed us to zoom in space and time—from the centimeter scale down to the submicron size of the beam, and to follow the dynamics and distributions of electrons and ions at different timescales," said Jean-Luc Vay, a senior scientist at Berkeley Lab who contributed to the WARP code and leads the Accelerator Modeling Program in the Lab's ATAP Division. Vay noted that aspects of the code proved key in the accurate modeling and understanding of differences between the effects of particle beams versus photon beams, and in finding the best way to tune and operate the system. Once the full diagnostic system is implemented at accelerator systems, simulations will help to reality-check the actual measurements in experiments and help to develop a path for optimizing beam performance. "Small changes could be resolved very precisely," she said, based on measurements of individual beam pulses. The proposed technique also opens up the possibility to study charge-induced dynamics in matter, and may provide more insight into timescales of fundamental atomic or molecular processes being studied with attosecond photon pulses, she said, including a property known as quantum tunneling in which a particle can appear to spontaneously "tunnel" through the potential barrier of the atom in defiance of classical physics. And Tarkeshian points out that the proposed diagnostic could prove useful for existing X-ray free-electron lasers (XFELs) such as the Linac Coherent Light Source (LCLS) X-ray FEL at SLAC National Accelerator Laboratory, the FLASH facility at DESY in Germany, the SwissFEL at the Paul Scherrer Institute (PSI) in Switzerland, among others, and facilities under construction like the LCLS-II at SLAC. For example, a prototype has been installed at LCLS with the support and contributions of SLAC scientist Patrick Krejcik and a team at PSI to diagnose the ultrashort, high-energy electron bunches produced by its accelerator. Tarkeshian noted that other tools have been developed to provide measurements of accelerator and XFEL beam properties, but as the beams' pulses pack more and more intensity and energy into shorter and shorter pulses, new tools will be needed to keep pace with these extreme beams. She credited some decades-old work on a proposed diagnostic for a test accelerator project at SLAC known as the Final Focus Test Beam, or FFTB, in paving the way for this new design concept. "In our latest work, we have studied not only the concepts but also have addressed the challenges that this technique may face experimentally," Tarkeshian said. "It's great to revive this unfinished concept from decades ago with new ideas, and with continued support we can realize its potential," she added. "This is a very open path, and we are just beginning." Leemans said, "We think that the practical realization of this innovative technique will ultimately be of broad interest to the international high-energy physics and the general accelerator-driven science communities." Here are another of my creations for future thought. I don't believe with this new accelerator can be used in megawatt mode or used to create antimatter.